In situ nanomechanics is an emerging field that investigates the mechanical properties and deformation mechanisms of nanostructured materials. The in situ nanomechanics research is typically conducted by integrating the real-time mechanical testing inside an electron microscope and the mechanics modeling with atomic resolution. 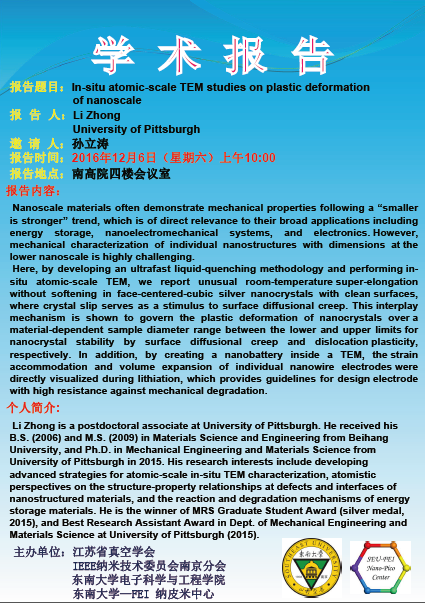 In this talk, Professor Zhu will present the recent in situ nanomechanics studies in their group, including the electrode degradation in nanoscale lithium-ion batteries (Nature Nanotechnology, 7, 749, 2012); fracture toughness of graphene (Nature Communications, 5, 3782, 2014); twinning-dominated deformation in BCC nanowires (Nature Materials, 14, 594, 2015); and stress-induced solid state amorphization in silicon nanocrystals (Nature Nanotechnology, 11, 866, 2016). He will also present ongoing work on the nanomechanics of heterogeneous nanostructured high-entropy alloys and 3D-printed steel. Ultimately, the in situ nanomechanics research aims to enable the design of nanostructured materials to realize their latent mechanical strength to the full.